Average litter rates have grown from fewer than eight pigs per litter in 1990 to more than 10 today. U.S. annual pork production has grown by more than 63% since 1990, and in 2015, it reached an all-time record of more than 24.3 billion lb. 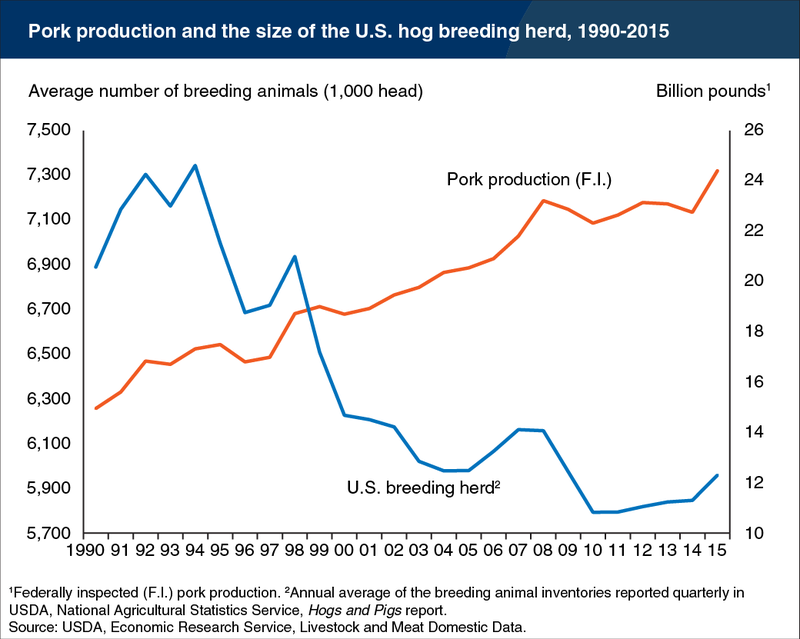 Over the same period, the size of the U.S. hog breeding herd declined by more than 13%, reflecting strong productivity increases in hog production. According to the U.S. Department of Agriculture, technical innovation in breeding and genetic research has yielded larger numbers of piglets per sow. U.S. average litter rates have grown from fewer than eight pigs per litter in 1990 to more than 10 today. Improvements in nutrition and barn management practices, combined with heavier slaughter weights, have also allowed the hog industry to reduce the size of its breeding herd while expanding production of pork, USDA noted.